How many times must I say this until you guys learn: Multiplayer first or it won't ever pick up. I know its harsh but its the truth. They tried, but got denied by Activison. So they are now doing this. And I respectfully disagree, if they are doing a port to a new system they may as well focus on the main deal first. There was already a multiplayer alpha out, it did't get much attention and it miserably failed. I don't see putting focus on something on which nobody plays. And either way, the multiplayer component will be built along with the singleplayer. Not sure where you read about that. And true, there are far more important aspects to get done right now besides something like multiplayer. The pace might be slow from my end at the moment, since there's still a few stuff left done getting the contents all ported but after that the pace should go back to normal. Yes, I agree with you. But still, this is a huge project with lots of things to get trough so the first step should be port the game to a better engine easier to build and mod from. They are not neglecting Multiplayer, just that there are things to do first. Nice, the rain feels so much real. I'm a little worried about zones where the light don't reach, it seems pitch black in those places. Have a question: Is it posible to make the kine in the streets available to talk? In whatever degree, are they able to move their mouths or script an Action button when you can talk to them? To my understanding, from reading AtrBlizzard and Stephen Webb chat about the project on skype, I wouldn't be quick to interpret it as the MP is playing second fiddle. The way this game is being produced differently than Resurgence. Hopefully it'll have you saying "Ori Ori Hallelujah!". I think one of the biggest issues with the Resurgence MP that wasn't really spoken about was how the Bloodlines maps didn't have the layout for good pvp death matches, aside from perhaps the warehouse train yard. Oh whoops, got Whitewolf and Activision mixed up. Point was, the earlier project attempt at multi-player failed because permission was denied. The project itself should be focusing on remaking and readying the port for bloodlines, THEN setting sites on the portrait linings (multiplayer, new weapons, etc). Heh, at least resurgence got farther then the Skyrim multi-player attempt. That ended up with just a chat box and the other player(s) going around as default naked nords in the T-Position. Are there any particular maps that weren't updated from 8.9, to get started them incorporated until 9.0 is out? Right now 40 maps have been changed while 64 stayed the same. Tell me which map you want to work on ;)! There's a high probability for that to happen once the main core is laid out, since it'd make as much sense for the multiplayer to be an actual role playing game. Would also have a regular deathmatch type of game mode with full disciplines and such as another multiplayer option. Unity will succeed where Source failed. Once the prototyping for that starts we'll be looking into gathering feedback from PV members exclusively. I saw the resurgence of facebook but you did on Source or unity? If it's on the Source you import it into Unity? In fact I was super excited when I read: "Integrated with Steamworks for achievements and storing contents online"
Resurgence was the Source version, while Vaulderie is being ported from the contents of Resurgence and patches applied within the Unofficial Patch. The Facebook page has a lot of stuff from the Source ones and the cannot be changed unfortunately, since it hit more than 200 fans. We do hope we'll get there but that'll have to wait for now. Workshop can do a lot of great stuff for modding and such, but there are of course the usual way to mod things for non-Steam users. Any of the Hollywood ones or between the special maps perhaps? The Santa Monica map is pretty much done, but any changes could be incorporated once the new patch is out. Any of the Hollywood ones or between the special maps perhaps? In Hollywood only the main hub, Luckee Star, Metal Head and last two warrens level have changed from 8.9. The Santa Monica map is pretty much done, but any changes could be incorporated once the new patch is out. I think I only fixed your map hole there and did apartment swapping to remove Mercurio's blood trail. Which you probably could handle much easier without the hazzle to swap around whole levels :)! 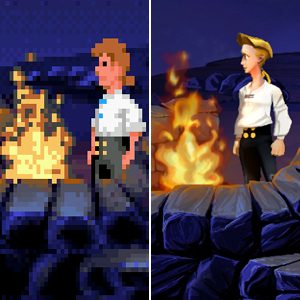 Certainly I'm not comparing Vampire the Masquerade: Bloodlines to the Escape From Monkey Island games from LucasArts, but LucasArts updated a game that originally came out in 1990 (The Secret of Monkey Island) and in 2009, they updated the graphics but the whole concept of the game was the same. I suppose this may be a silly question, but the graphics will be improved at least slightly? I don't know anything about building games, or very much about the Unity engine, only that it is mentioned a lot in in the Indie gaming world (I watch a lot of gameplays w/ commentary on youtube and most of them are from the Unity engine). Here is a before and after. I'm not saying Bloodlines is as bad as the left, in fact it's a beautiful game for turning 10 years old this year, but I suppose it is just something I've wondered about. Can the characters be given that extra oomph?